Rob Lowe as Col. Ethan Willis on CBS' "Code Black" with Marcia Gay Harden in fall 2016. 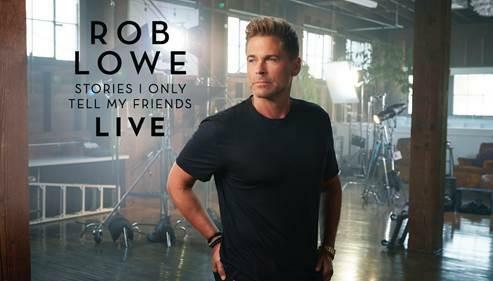 Tickets go on sale Friday for actor Rob Lowe's one-man show, Stories I Only Tell My Friends Live!, at the Aronoff Center's Procter & Gamble Hall Saturday June 1. Lowe, who grew up in Dayton, Oh., has amassed nearly 100 acting credits since appearing as Eileen Brennan's son on ABC's sitcom A New Kind of Family in the fall of 1979, and a starring role in the movie St. Elmo's Fire in 1985. Publicity photo for Lowe's speaking tour. For the past 20 years, he has regularly found work in such TV series as The West Wing, Brothers & Sisters, Parks and Recreation, Californication, The Grinder and Code Black. His current TV project, for British broadcaster ITV, is starring as Wild Bill, a brash U.S. police officer hired as police chief in eastern England. From the Cincinnati Arts Association's release: "Inspired by the success of his two New York Times best-selling memoirs, Stories I Only Tell My Friends and Love Life, Rob has created an all-new peek behind the curtain at Hollywood, fame, fatherhood, marriage, and a life lived at the forefront of culture for four decades. Broadway World calls Lowe 'as personable and charismatic of a presence onstage as he is onscreen.' "
Lowe guests on Stephen Colbert's "Late Show" in 2016. Lowe, who celebrated his 54th birthday on St. Patrick's Day, was born in Charlottesville, Va., and grew up in Dayton. He attended Oakwood Junior High School before moving to the Los Angeles area with his mother and brother, Chad, and attended Santa Monica High School. Tickets ranging from $30 to $65 plus fees will be available at 10 a.m. Friday, March 22 from www.CincinnatiArts.org, 513-621-2787 and the Aronoff Center ticket office. A $250 meet-and-greet package includes one "premium ticket," a post-show meet and greet, a professional photo with Lowe and a signed copy of his Stories I Only Tell My Friends book. The Big Bang Theory, TV's No. 1 sitcom, will sign off Thursday, May 16, with a one-hour episode, says CBS, which has announced season finale dates for its prime-time lineup. The city of Hamilton knew it didn't want to throw away its shot when Lin-Manuel Miranda's musical Hamilton came to Cincinnati. Hamilton Mayor Pat Moeller on Wednesday presented two actors from the touring production, now at the Aronoff, with a proclamation honoring the hit show.